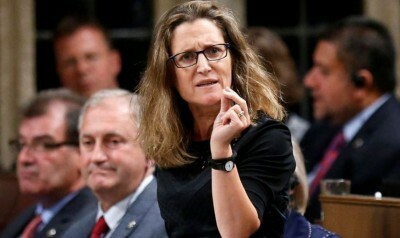 Once again Canada’s Foreign Minister, Chrystia Freeland, jumps on the anti-Russia bandwagon, mimicking the rhetoric stemming from Hillary Clinton’s failed presidential run and the fabrications of the DNC, the FBI, CIA, Christopher Steele, and a whole menagerie of other elements. It is not surprising given her historical background relationship with Ukraine and her support of the US supported Maidan coup. While she insists “rule of law” is not a “smorgasbord” from which to pick and choose, she and her cohorts in the Liberal party appear to do just that in many cases ranging from Huawei, Venezuela, and Israel on the international scene to the recent SNC-Lavalin affair for domestic policies. But that aside, this is greater than the rule of law, it is all about foreign meddling, not by the Chinese, nor the Venezuelans, but by her favorite, Russia. What the nature of this chaos is I am not sure. Is it the truckers rally/drive across Canada to protest the lack of a pipeline? Is it the indigenous people blocking a road on their unceded territory? Is it electing populists like Doug Ford who rant on about the carbon tax? Is it the many women who turned their backs on Trudeau during the recent Daughters of the Vote who sat in Parliament for a day – or that some of them actually rose and left when opposition leader Scheer was to speak? Is it the barrage of anti-identity issues put forth by the conservative right wing? Without their definition of chaos and dissension, it is hard to tell. But for me and the Russians, it all boils down to whom will I give my vote. The Liberals are not doing what the Liberals promised to do and are obviously hand in hand with the corporations and financial benefactors rather than with the environment, voting changes promoting democracy, and any real movement on indigenous affairs, especially concerning the Indian Act of 1867, not to mention using “rule of law” as a smorgasbord. Further, their foreign policy is so in line with U.S foreign policy I wonder why we bother pretending to be an independent state. So I don’t want to vote for them. Sunny ways have given way to cloudy days.